As new DSLR camera resolutions gradually rise, so do the demands they make on lenses. 12 or 15mp DSLR bodies really show up any weakness in performance, so as always, my advice would be to spend as much as possible on lenses, even if it means a lower specified camera body. Almost any digital SLR camera sold today is capable of superb results. Unfortunately, the same is not true of lenses. Canon 18-55mm IS : I’ve still to get around to full review of this version of Canon’s standard kit lens but initial impressions are very favourable. OK it still feels like a big lump of plastic, not an engineering masterpiece, but optical performance is better and the Image Stabilisation works really well, giving me sharp images at shutter speeds down to about 1/8 second. That’s about 4 stops of an improvement. Not bad for £ 50. Sony 18-70mm f3.5-5.6 : As a long time Minolta fan I’ve recently had a look at the Sony range. Unfortunately, if you’re looking at buying a Sony DSLR this lens is best avoided. Yes this is a cheap option, but the cameras deserve much better. Performance at wide apertures is poor and even stopped down not that great. I haven’t tried the more expensive Zeiss options, so the Tamron 18-250mm or Tamron 17-50mm f2.8 would be my choices. The good news for Sony buyers is that the Sony 75-300 often sold in kits is actually surprisingly good value. More Sony / Minolta lens reviews to come. 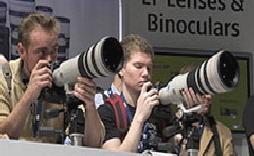 Canon lenses, of all ages, tested with both the Canon APS-C and full frame digital SLR cameras. Nikon DX 18-55 VR and Nikon 55-200 VR now tested - how good are these lightweight contenders for your Nikon digital SLR camera? Nikon lenses old and new tested with Nikon DSLRs. Which are the best buys and which should you avoid? Sigma’s 70-200mm f2.8 EX APO HSM is their competitor for Nikon and Canon’s pro 70-200 f2.8’s. How does it measure up in it’s own right and how does it compare to my old Nikon 80-200 2.8? I’ve owned my Nikon 80-200mm f2.8 for a long time and it’s never let me down. It will take something very special to replace it. Just to be fair I’ve tested it on it’s own and compared the results to those from the designed for digital Sigma. Which is best? Which kit lens is best? For those of you trying to decide on the best digital SLR camera to own, which system to buy into is a big decision. Cameras like the Nikon D90 or the Canon EOS 450D / Digital Rebel are all excellent digital SLR cameras, but what about the standard Nikon or Canon zoom lenses supplied with them? Who makes the best digital SLR kit lens? Full tests reports on the Nikon 18-70mm and the Canon 18-55mm EFS.